Author of uhow to Identify Old China" and "How to Identify Old Chinese Porcelain"
Early in the eighteenth century there lived in China a French Jesuit priest, Pere d'entrecolles by name. This man was deeply interested in the Chinese, their arts and industries, about which he wrote long letters to the Pro-cureur of the order in Paris. Two of these letters - the first written in 1712 and the second from King-te-chen (the seat of the imperial china factory) in 1722 - described minutely the manufacture of porcelain. These letters were published by Du Halde, and were eagerly read by European chemists, potters, and men of science. The Father was a man of keen observation, with a true appreciation of art and the picturesque. His descriptions of life and scenery in China are vivid and realistic, and it is to his word pictures that Longfellow's poem ' Keramos " in part owes its origin. We can well understand how the poet's fancy would be roused by the description of Kmg-te-chou, with its long street, its magnificent temple dedicated to the Queen of Heaven, and built by a merchant prince who had amassed a large fortune in "the Indies," and above all by the weird scene at night when the glow of three thousand furnaces would seem to change it into a veritable "burning town." 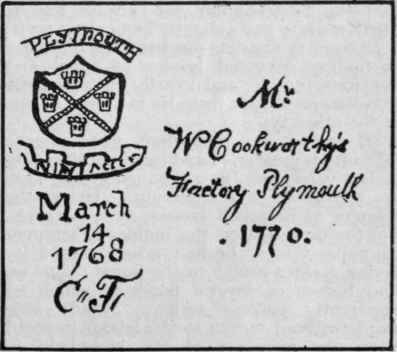 William Cookworthy was born at Kingsbridge, in Devonshire, in 1705. He was descended from the ancient Devonshire family of Cookworthy, one of his ancestors, the Rev. John Cookworthy, being vicar of St. Andrew's, Plymouth, in 1427. Left fatherless at the age of 14, he was apprenticed to a firm of London chemists named Bevan (a firm which still flourishes as Allen, Hanbury & Co.). many privations; but so well did he please his employers that, at the termination of his apprenticeship, they assisted him to set up for himself in Plymouth under the name of Bevans and Cookworthy. Being an accomplished French scholar, Cookworthy studied the letters of Pere d'entrecolles. As a chemist, he would obtain from these useful hints as to the methods and ingredients used by the Chinese in the manufacture of their porcelain, and, since he was well acquainted with the minerals and geological features of Cornwall, he set to work to search there for the essential constituents. It is said that he first discovered porcelain granite in the tower of St. Columb's Church. This had been brought from the neighbourhood of St. Stephen's, and he afterwards found immense quantities of petuntse and kaolin in other parts of Cornwall. 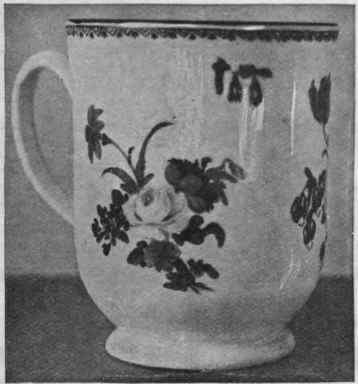 A patent to make porcelain was taken out by him, in conjunction with Thomas Pitt, in 1768, but a paper is still in existence in which he says, "it is now twenty years since I discovered the ingredients." As there is evidence that this paper was written about the year 1768 this would place the discovery in the year 1748. Plymouth porcelain is composed of kaolin, or china clay, and petuntse, which is china stone, granite being the source of both these ingredients. It will be readily understood by those who read the description of the component parts of soft paste porcelain that Cook-worthy's body was of a very different texture; it closely resembled that of the Chinese in hardness and durability. If the test applied to soft paste porcelain be tried upon a piece of Plymouth it will be found impossible to make more than a mere scratch with a file, for Plymouth is hard, or true porcelain. At the time of the disastrous fire some years ago at the Alexandra Palace thousands of beautiful pieces of soft paste porcelain were reduced to a shapeless mass, while those of Plymouth and Bristol passed through the fire retaining their form and whiteness, and the most delicate details showed no signs of fusion. The chief characteristics of this porcelain are the dull glaze, frequently smoked in the kiln, and the ridges caused by imperfect "throwing" on the lathe. These ridges, or "wreathings," are also found on Bristol porcelain, but they are not found on any other china made in our country. They must not be confused, therefore, with the rings sometimes met with on Chinese porcelain. These latter form complete circles, whereas those of Plymouth and Bristol are spiral, and can be best seen when held obliquely to the light. Upon the little pepper-pot illustrated these spiral ridges are so pronounced that they can be seen from a distance of several yards. Figures, animals, and sauceboats, in white, with raised moulded designs and flowers in high relief, were made at Plymouth. They are very much discoloured or smoked, but in spite of this the figures have a great charm. The discolourment and a certain iridescence in the glaze adds rather than detracts from their beauty by throwing up the characteristic of this factory. Of these, some are in white, others are decorated with designs in blue under the glaze, while the finest examples are enamelled in colours. Large centre-pieces with dishes mounted upon piled-up shells are generally surmounted by a dolphin. Cookworthy outlines and serving as shadows in drapery and under the raised flowers with which the base and background are embellished. Fruit - dishes and salt - cellars mounted upon rock and shell work are somewhat Cookworthy's blue and white porcelain was not so successful as that decorated in colours. The blue employed was of a black or greyish tint, and is generally found to be bleared in the firing. The pepper-pot is decorated with a dark slate-blue under the glaze, and with Indian red over the glaze, the design being one of Chinese origin. In these days Plymouth porcelain is very rare, and commands high prices, and it may be of interest to mention that this charming little specimen was picked up for a shilling from a dealer who evidently did not know the characteristics of this china. Some of the finest examples of Plymouth porcelain are those enamelled in colours and copied from Oriental designs. Still in existence, for example, is a teapot decorated in brilliant reds, greens, and yellows, in exact imitation of some of the work by that famous Japanese artist Kakiyemon. Fine large figures were manufactured at Plymouth. These were decorated in brilliant enamel colours. They are rarely met with in private collections, but some beautiful specimens may be seen in the Schreiber collection at the Victoria and Albert Museum. Plymouth and Bristol porcelain closely resemble one another, but while the Bristol artist shows hard lines in his work, it will be noticed that the flowers upon the other are more sympathetically treated; the style is softer and more true to nature. Also, while the gilt edge upon Bristol china is noted for its solidarity, that upon Plymouth is frequently size-gilding. 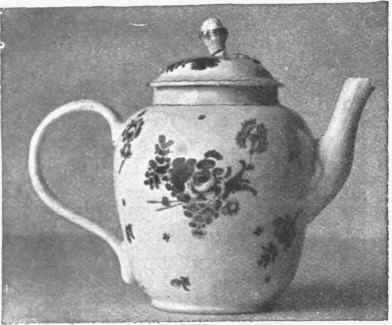 The teapot illustrated is another example of Plymouth porcelain decorated with detached sprays, sprigs, single leaves and blossoms. The shape of the handle and narrow ring at the bottom are somewhat distinctive of this factory. The edges are lined in reddish brown. Indeed, this colour, or a chocolate brown, were almost always used as edging at Plymouth in place of gold. 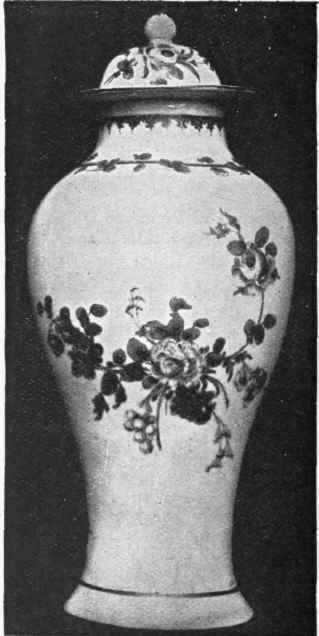 The third illustration shows one of a set of vases, in the Victoria and Albert Museum, which serve to demonstrate the simplicity of form and decoration adopted by Cook-worthy. The flowers are well and artistically painted, the colours are brilliant, gold is sparingly used, and the spiral ridging is distinctly visible on the lower part of the vase, making it, as a whole, a most characteristic specimen of Plymouth china. A large proportion of Plymouth porcelain is unmarked. 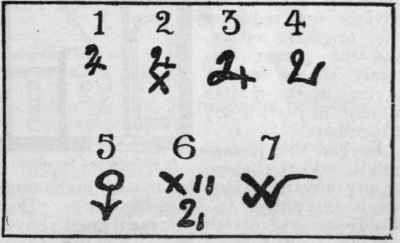 Where, however, a mark was employed by Cookworthy upon his wares it generally took the form of the alchemist's sign for tin, which resembles the combined numerals 2 and 4. It appears in a grey blue under the glaze, and a red brown over the glaze. The mark in gold is found upon some fine pieces, but these are generally believed to have been made at Bristol, as were also pieces which bear the marks of both factories. In 1770 the Plymouth works were removed to Bristol, where Cook-worthy appears to have continued to make porcelain at Castle Green, in conjunction with Richard Champion, till 1773. In that year he retired from business, and devoted his remaining years to the ministry of the Society of Friends. He died in 1780.